Junior 4-To-Score is perfect for turning playtime into learning time. 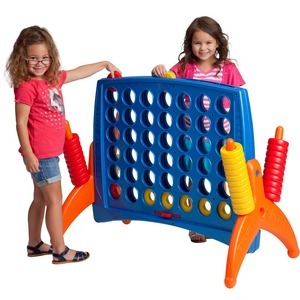 While they learn to match four to win, young players build teamwork and cooperation skills as well as problem-solving and basic matching skills. This interactive game is great for two players and also works well with teams. Heavy-duty plastic is fade-resistant and weather-resistant so it can be used indoors or outdoors. Game is recommended for children ages 3 and up.